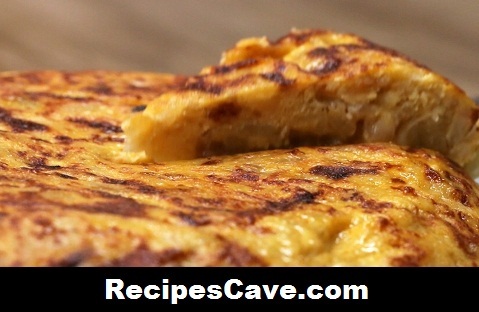 Spanish Omelet Recipe - Easy omelet recipe for omelet lover, this is come from Spain and named Spanish omelet recipe. Follow simple steps what to do with this. Here is what you'll need to cook Spanish Omelet recipe or spanish Tortilla de Patatas. Heat up the olive oil in a really hot pan. Slice the potatoes into 3-millimeters thick pieces. Fry the vegetables in the olive oil over high heat for 10-15 minutes until they caramelize. Drain the vegetables and save the olive oil for later use. Add 6 eggs to a bowl and whisk. Add the fried vegetables, stir, and leave to set for 15-20 minutes. In a nonstick pan, fry the egg mixture over high heat for 1 minute, then reduce to a low heat for 2-4 minutes. Cover the pan with a large plate and carefully turn the omelet out onto the plate. Slide the omelet back into the pan and fry for a further 3-5 minutes over low heat. To check the omelet is cooked, gently press on the centre of the omelet. If the surface springs back, it is ready. Repeat step 8 to remove omelet from the pan and enjoy. Your Spanish Omelet Recipe is ready to taste.